Song Chen and Shuo Luo are first authors. Mitochondrial complex I is important for cellular ATP production by transporting electrons and generating proton gradient across the mitochondrial inner membrane (Hirst, 2013). It is also a major cellular locus where electron leakage to oxygen produces superoxide, an ROS (reactive oxygen species), particularly under oxidative stress conditions. Dysfunctional complex I contributes to the most common oxidative phosphorylation disorder in humans, with many identified genetic mutations in complex I subunits causing a variety of human disorders including Leigh syndrome, encephalomyopathy, cardiomyopathy, parkinsonism and hereditary optic neuropathy (Hirst, 2013; Guo et al., 2017). In addition, complex I is the major target of many parkinsonism-causing neurotoxins including rotenone and MPTP. Past biochemical, cell biological and structural studies have elucidated how complex I functions normally in mitochondrial respiration (Hirst, 2013; Guo et al., 2017; Letts and Sazanov, 2017). Nonetheless, our understanding of mechanisms how complex I dysfunction leads to human diseases is far from completion; therapeutic targets and strategies are urgently needed. Here, we use the genetically tractable C. elegans to develop a novel disease model for mitochondrial complex I dysfunction-induced dopaminergic neurodegeneration. We found that partial loss-of-function of a key complex I subunit NDUF-7 caused dopaminergic neurodegeneration in a dopamine neuron subtype-specific manner. In exploring “therapeutic” strategies to treat such “Parkinsonism” model, we show that genetic deletion of the C. elegans orthologue of VHL (von Hippel-Lindau) or pharmacologically providing mitochondria-targeting antioxidants can effectively rescue dopaminergic neurodegeneration. Our findings reveal neuron subtype-specific dopaminergic neurodegeneration caused by mitochondrial complex I dysfunction and identify novel protein targets and promising pharmacological leads to treat complex I dysfunction-related mitochondrial disorders. 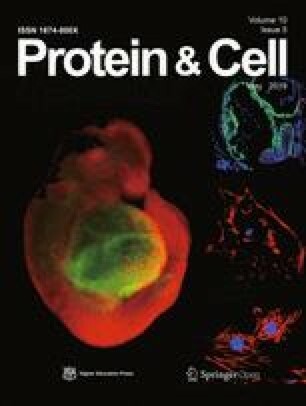 To examine phenotypic consequences of complex I dysfunction on dopamine neurons, we generated a compound C. elegans strain with two integrated genetic markers of fluorescent proteins, including zcIs9 [hsp-60p::GFP] to monitor the mitochondrial unfolded protein response (mito-UPR), otIs181 to mark all 8 dopamine neurons (4 CEP, 2 ADE and 2 weakly fluorescent PDE neurons) and 2 non-dopaminergic AIY neurons (Fig. 1A and 1B), and with a partial loss-of-function mutation of the gene nduf-7 (Flames and Hobert, 2009; Rauthan et al., 2015). nduf-7 encodes a protein orthologous to NDUFS7, the NADH Ubiquinone oxidoreductase Fe-S protein, one of the 45 highly conserved protein subunits of mitochondrial complex I. nduf-7(et19) is a nonsense mutation that removes the last 5 highly conserved amino acids of NDUF-7 and causes reduced mitochondrial complex I activity and constitutive activation of mito-UPR (Rauthan et al., 2015). We first confirmed that nduf-7(et19) caused constitutive mito-UPR in C. elegans with strong zcIs9 [hsp-60p::GFP] expression in the intestine (Fig. 1C and 1D). To examine potential dopamine neuron phenotypes of nduf-7(et19) mutants, we characterized the mCherry-marked cells in both larval L4 and adult stages of animals and compared the nduf-7 mutant with wild type. nduf-7(et19) did not appear to affect the 4 CEP neurons or the 2 AIY neurons, based on their morphologies and characteristic locations in the animal at the stage L4 (Fig. 1D). By contrast, we found that the two ADE neurons from L4-stage nduf-7(et19) mutants were strikingly missing in a large fraction of animals (exemplar images shown in Fig. 1D). 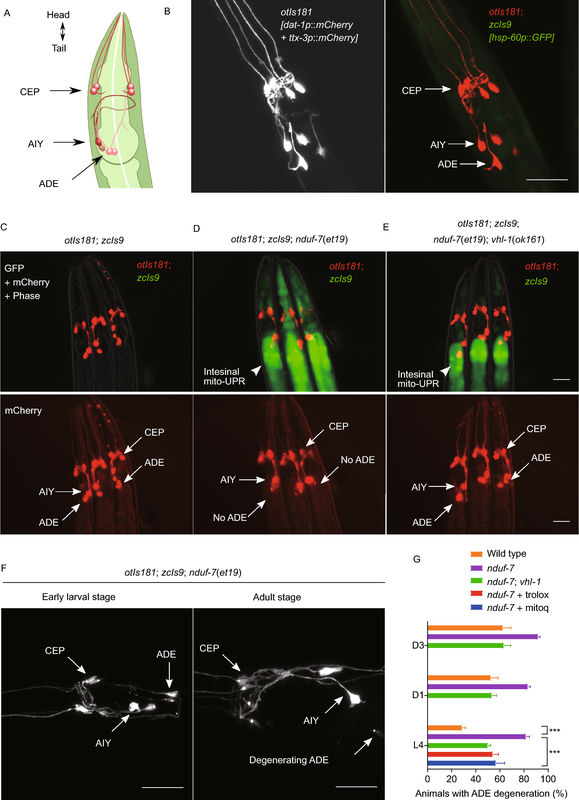 The larval L3-stage nduf-7(et19) mutants also exhibited ADE neuron loss but to a lesser degree. Two PDE neurons have very weak mCherry signal, even in wild type animals. CEP neurons became loss at a much later stage (i.e., day 3 adult). AIY neurons were morphologically normal throughout development in WT and mutant animals. Thus, for the remainder of the study, we focused on characterizing how the marked ADE neuron loss (or neurodegeneration, see below) in nduf-7(et19) mutants can be rescued by genetic and pharmacological means. In humans, mutations in NDUFS7 cause Leigh syndrome, a severe neurological disorder that is characterized by bilaterally symmetrical necrosis and neurodegeneration in subcortical brain regions. Recent studies showed that chronic hypoxia exposure can be an effective therapy to treat mouse models of Leigh syndrome (Ferrari et al., 2017; Jain et al., 2016). To test directly whether HIF (hypoxia inducible factor, the master transcriptional mediator of cellular hypoxic response) can modify ADE neurodegeneration, we generated another compound C. elegans strain with zcIs9; otIs181; nduf-7(et19); vhl-1(ok161). ok161 is a genetic deletion that causes loss-of-function of VHL, the sole E3 ubiquitin ligase to degrade HIF, and leads to HIF stabilization and constitutive activation of HIF target genes (Shen and Powell-Coffman, 2003). We found that vhl-1(ok161) markedly suppressed effects of nduf-7(et19) in causing the ADE neuron loss (Fig. 1E). CEP, AIY and ADE neurons in larval L2-stage nduf-7(et19) mutants were largely normal compared with those in the adult stage (Fig. 1F), supporting that the lost ADE neurons were indeed caused by neurodegeneration, rather than defective dopamine neuron specification and differentiation. ADE neurodegeneration appears to be progressive over time in wild type and worsened in nduf-7(et19) mutants and restored in nduf-7(et19); vhl-1(ok161) double mutants (Fig. 1G). These results show that VHL-1 inactivation by genetic means can rescue ADE neurodegeneration caused by nduf-7 mutations. Next we sought pharmacological agents that can rescue the nduf-7(et19)-caused ADE neurodegeneration. We treated the zcIs9; otIs181; nduf-7(et19) animals with a panel of 14 diverse compounds of mitochondrial modulators and identified two compounds that were effective in rescue: mitoQ and trolox (Murphy and Smith, 2007). MitoQ is a ubiquinone derivative that accumulates in mitochondria owing to the covalent attachment of the cation triphenylphosphonium. Trolox is a cell membrane-permeable, water-soluble derivative of vitamin E with potent antioxidant properties. We cultivated zcIs9; otIs181; nduf-7(et19) animals with exposure to these two compounds for 24 h prior to scoring ADE neurons at L4 stage and found that both treatments effectively alleviated ADE neurodegeneration (Fig. 1G). Such effects were particularly pronounced in L4-stage animals, indicating an optimal time window of treatment before neurodegeneration becomes irreversible. These results show that mitochondrial antioxidants when administered early enough can alleviate ADE neurodegeneration, which is caused by nduf-7 mutations likely through impaired mitochondrial respiratory functions. Loss of vhl-1 strongly rescued ADE neurodegeneration but not the constitutive mito-UPR of nduf-7 mutants (Fig. 1E), suggesting that mechanism of rescue by loss of vhl-1 might be independent of mito-UPR and/or ROS. The superoxide anion, a major type of ROS, is generated as a by-product of mitochondrial oxidative phosphorylation and its levels can indicate mitochondrial states of respiratory functions. We used a fluorescent dye MitoSOX red to measure steady-level superoxide levels in nduf-7 and nduf-7; vhl-1 mutants. We found that the posterior bulbs of nduf-7 mutants exhibited lower MitoSOX signals than wild type (Fig. 2A), indicating that mitochondrial respiratory activity is decreased, consistent with an important role of NDUF-7 for mitochondrial complex I functions. Reduced MitoSOX signals in nduf-7 mutants also suggest that mitochondrial antioxidants rescue ADE neurodegeneration likely through restored mitochondrial respiratory function rather than alleviating excessive superoxide toxicity. Furthermore, we found that nduf-7; vhl-1 mutants exhibited higher MitoSOX signals than nduf-7 single mutants (Fig. 2A and 2B), indicating restored mitochondrial respiratory function. Taken together, these results suggest that mechanisms of rescue of ADE neurodegeneration by vhl-1 inactivation likely act through modulating mitochondrial respiratory functions. Although numerous lines of evidence support causal roles of mitochondrial complex I dysfunction in the pathogenesis of Parkinson’s diseases, deletion of NDUFS4, a key complex I component, globally or selectively in dopamine neurons did not result in apparent overall dopamine neuron loss in mice (Choi et al., 2017). In C. elegans, we found that complex I dysfunction by genetic mutation in nduf-7 causes degeneration of ADE neurons but not the other 4 CEP dopamine neurons at early stages of animals, although we did observe that CEP neurons also degenerate at later stages. Our findings suggest that complex I dysfunction might also cause dopamine neuron subtype-specific progression of degeneration at different ages and to different degrees in mammals. 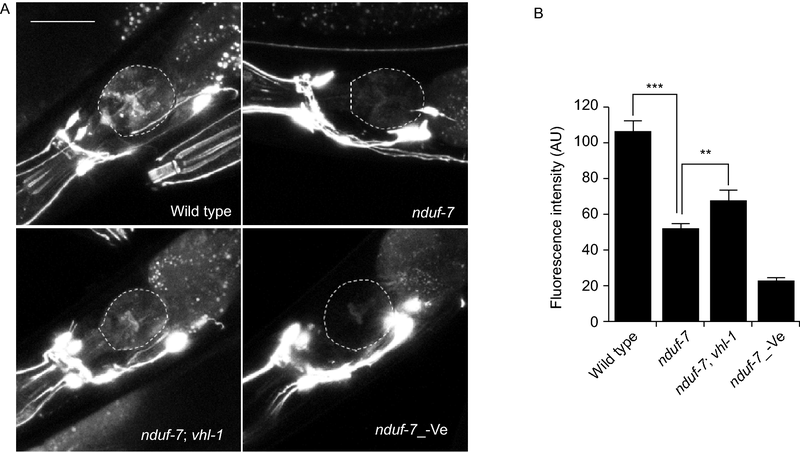 We further identify vhl-1 as a genetic modifier and mitochondria-targeting antioxidants as rescuing pharmacological agents for this previously undescribed dopamine neuron subtype-specific neurodegeneration in C. elegans. Whether rescue by VHL inactivation and mitochondrial antioxidants can be recapitulated by hypoxia treatment or HIF activation remain to be investigated. Based on our findings, we propose that VHL inactivation and mitochondrial antioxidants protect against complex I dysfunction-induced neurodegeneration by modulating mitochondrial respiratory activity. Therapeutically, inhibitors of VHL and mitochondrial antioxidants may lead to development of potential treatments for Parkinson’s diseases and more broadly complex I dysfunction-related mitochondrial disorders. We thank the Caenorhabditis Genetics Center for C. elegans strains. The work was supported by NIH grant R01GM117461, Pew Scholar Award, Packard Fellowship in Science and Engineering (D.K.M), and a fellowship from China Scholarship Council (S.C.).